Awesome Event Come Join Us!! I'm his foster mom....he is an awesome boy. A year and a half. Got him Saturday. He is trained, fixed, utd on everything!!!! Thank you so much, Jennifer, for bringing this beautiful boy into your heart and home! 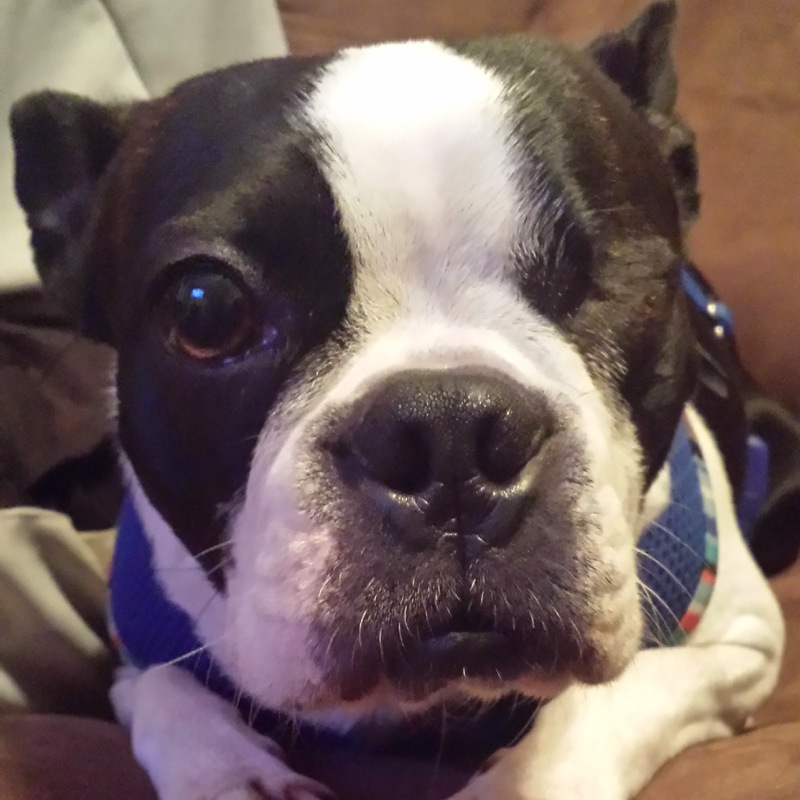 This is a memorial tribute about a Boston Terrier, Ziggy, who had an unfortunate beginning but found forever with his foster mom, Linda Antonelli- who helped heal him. It is with such a broken heart that I want to share that my sweet, handsome, angelic, love able 13 year old failed foster Harley went to the Rainbow Bridge last night. He had a tumor on his backside and it would not stop bleeding and he was in pain. Run free my sweet boy. My heart is truly broken! And you will be with me forever! I love you baby! So very sorry for your loss of Harley but he knew what true love was. Run free sweet baby there is no more pain. 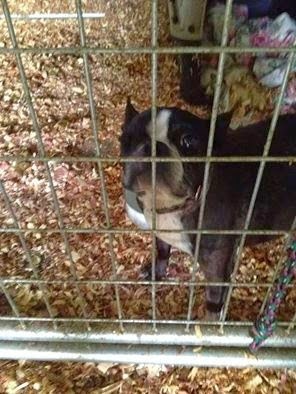 Oh Linda I am so sorry for your loss of precious Harley. 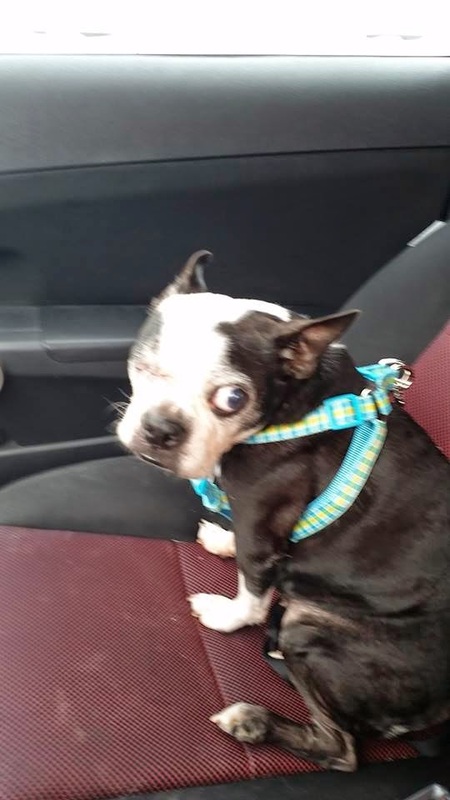 You took him in, nearly blind and deaf, when his owner was dying. 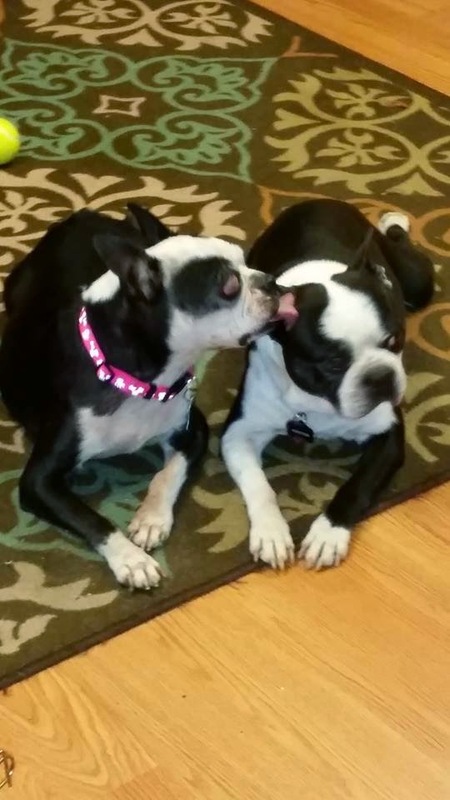 You granted her the gift of knowing her beloved Harley would continue to be loved and gave Harley the gift of deep love and companionship. You really are a rescue angel to both dogs and owners. Thank you for your incredible kindness. 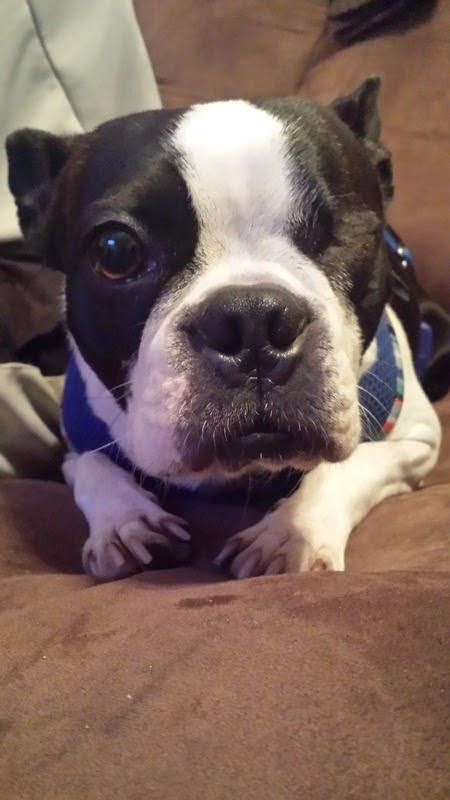 Joey is doing great at his forever home. He loves his fur brother and the 5 grandkids that came to visit. I miss him, but so happy for him. 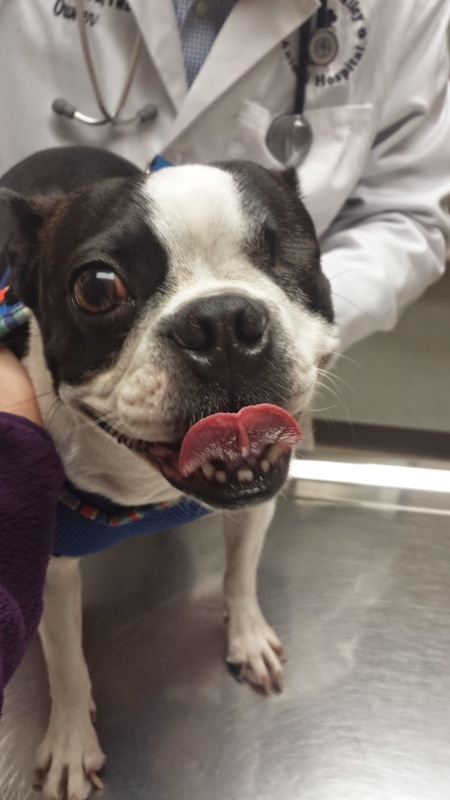 This is a wonderful success story for Joey. He is the 11 year old deaf baby who found a family to love and who loves him. If you are interested in his story, check out his pre-adoption video. How could someone not love him? NEBTR got involved with a North Carolina shelter because they had some dogs listed as "BT mixes" and were cheduled to be PTS. None were even close to BT but once involved and looking at the faces...it was very difficult to turn away. Both Vicki and Maria said they would each take one. This shelter in NC (Rowan County shelter) is a very high kill shelter. These dogs don't have beds or any vet care whatsoever. Cindy of BTR of east TN had them pulled in the nick of time on Monday and had them vetted. We literally saved these two from being killed. Above is ten month old Frodo. Maria says, "A special boy, saved for a special reason!" He is a tiny 25 lbs. and at 10 months has a bit more growing to do. Sweet with kids, dogs, cats, special needs & seniors! Many, many thanks to Vicki and Maria for taking these special boys in and for saving their lives! Above is Mr. Peabody with his foster mom Vicki Cuneo. Isn't he adorable? "Mr. Peabody, our new Tar heel foster, received his package of yummy treats yesterday and would like me to pass on to you how appreciative he is of all the thoughtfully selected toys and snacks. He is settling in nicely and looks forward to polishing off each and every piece that came in his mailbag. Came home today to find box after box of things for Petunia that were on her wishlist. I was literally in tears while opening them all. I'm truly amazed at the kindness strangers have shown to this little girl. She came to me with nothing and now has everything she could hope for. 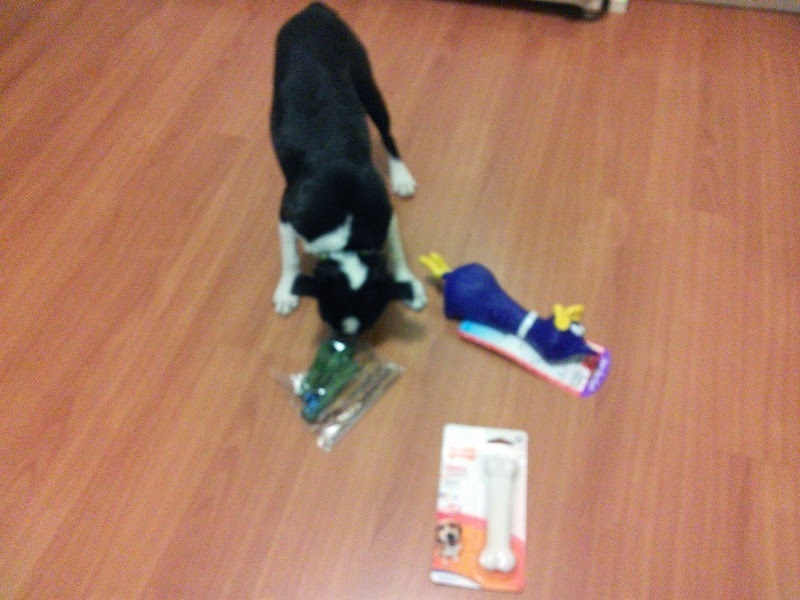 Foster puppy Brooklyn, our five month old surrendered to us last week, wishes me to thank everyone for her nice gifts. Terri Anderson sent her nice pink chew toys and NEBTR members and supporters sent a package of things, a rubber ducky, chewies, and a Nylabone. She is adorable, so cute and hyperactive, then, like most puppies, she collapses into a sound sleep. She loves going for walks around the neighborhood, making friends with everyone, learning to walk on leash, even tolerating the sweater and harness because she understands that means she is going for a walk. 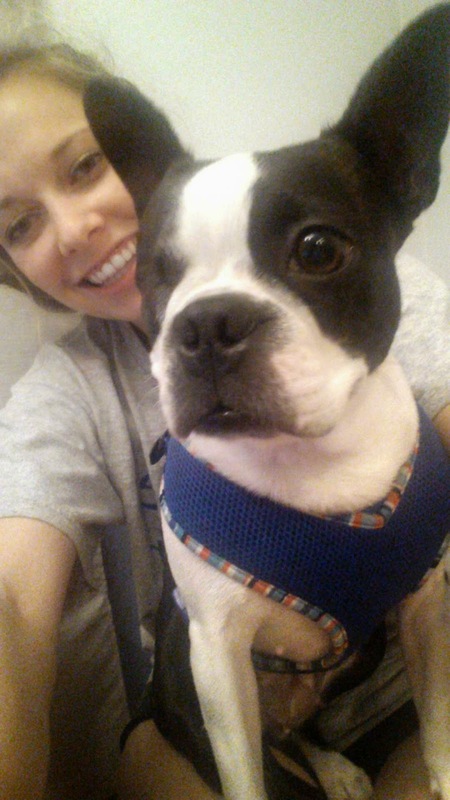 Brooklyn had her wellness exam: she is very healthy, patellae are good, weight 12.8 lbs, and loved going to the vet. Everyone made a big fuss over her, a mutual admiration society. Spaying is scheduled for 19 November. She is incredibly gorgeous and fit, especially considering she came from a pet shop, presumably a puppy mill baby. The mutual love affair between her and Abigail continues, BFFs, but at least they are getting some sleep; must admit, I could live without the 3:00 am wake up call to play. At night she sleeps with her head on my neck by the carotid artery (I assume my pulse reminds her of her mother's heart beat), or with her face in my ear, she snores like a chain saw. Today she did some redecorating until discovered, chewing on my c 1850 burled walnut French biedermeier china cabinet, but not too much damage was done. 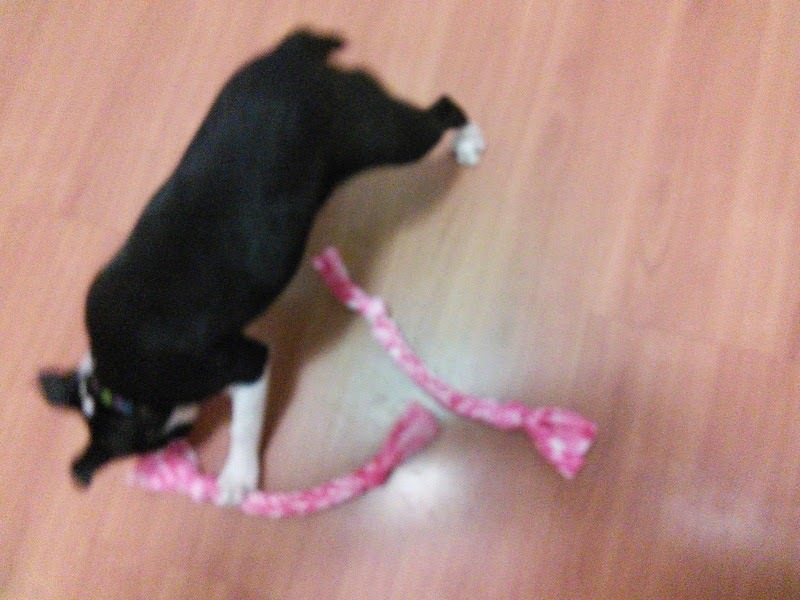 I guess it is more fun than a chew toy and helps w ith the teething, she has good taste. Brooklyn is professionally cute, as are all Bostons, but I think more so than most, she really is a pretty pup and so sweet. Very easy to love. The ideal home would be nearby, with visitation rights for Abigail and me. Oh, and I forgot to mention one other thing... Until I find my forever home, I could use a few things to help me get by at my foster mom's house. As I mentioned, I didn't come with much. I would be so grateful to have a bed of my own... And some treats! Might I be so lucky?! Oh friends, I am so happy to see you! It seems like only yesterday I was tied to a porch, scared and alone with no toys or even a bed. My foster mom says I'm a lucky girl, and so she calls me Penny. I love my new name - and my new life. My foster mom tells me there's something called a "forever home," a place where I will go and the people there will love me unconditionally. They will snuggle with me, scratch my bum, give me kisses and food and treats, and I never have to be abandoned again. I can't believe such a wonderful place exists, and I am so excited to find it. Let me tell you a little bit about me. I am a REALLY good girl. I am fun and energetic, but also know when to chill out and hang in my crate. I love being around people, but I'm also okay to hang alone for awhile. I haven't met anyone (or anything) I don't like! Dogs, cats, kids, strangers, you name it - I'm okay with it! I guess I should mention my "disabilities," even though they really don't bother me! But for the sake of full disclosure, I only have one eye, and I am partially (maybe fully) deaf. I have such a great attitude though, that these things don't slow me down or make me sad. If anything, they just make me more special. Not to boast, but I'm pretty sure I would make a perfect companion to just about anyone. The vet estimates I'm 2-4 years old, and have no other health issues. The only thing that needs permanent fixing is my heart - and I think it will be a pretty easy recovery The only thing that would make this Penny luckier would be to have a family who will love me forever. Won't you consider adopting me? Please fill out an application for me atwww.nebostonrescue.org. If you are reading this and already have an application pending, comment below and let NEBTR know! THANKS TO ALL WHO ENTERED AND ALL WHO VOTED! 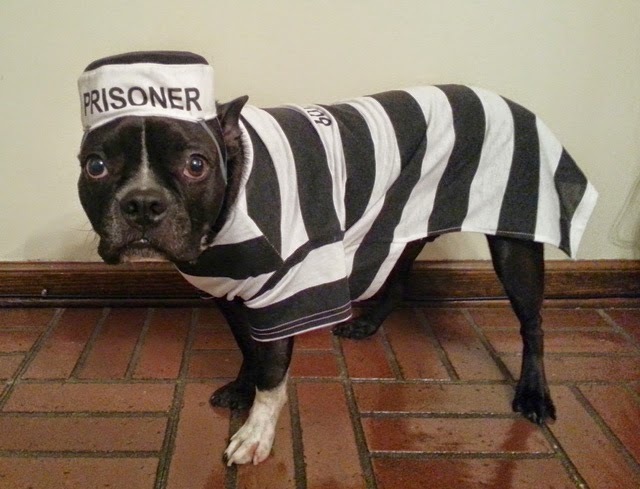 When we first entered Cody into the Halloween contest, votes were very slow coming in. I decided I needed to raise awareness of Cody and NEBTR by launching a rigorous campaign. I promised my friends and family that if Cody got enough votes, my husband and I would post a picture of the two of us wearing the matching Boston Terrier PJs! Well votes started rolling in! So while my friends and family obviously wanted to see us in those PJs, they also knew that every dollar they voted was going to a great cause! The real winners are NEBTR and all the pups that are going to get the loving care they need. I'm so proud of my generous friends and family, and of course my Cody! Wonderful! Congratulations Kristy! And thanks for everything that you did for this boy! How awesome for him - a new Mom and a bonus brother!!! It's with much sadness that I am writing to say that our Becky passed over the Rainbow Bridge this evening. She collapsed after going out to potty, and I picked her up and held her, and she passed peacefully in my arms. Even if it seems impossible, I fell in love with her for the 2 short weeks that she was with us. I knew that she was not well, and at 12 years old, did not have time on her side. I just didn't expect her to pass so soon. I've attached some photos that I took last week, when I had hopes we could enjoy more time together. Please hug your senior dogs, and think of us. Oh Loretta, I'm so very sorry. Thank you for giving her the gift of love and happiness at her end, I know she felt safe to cross with you being there. Loretta, she was so beautiful. I am so sorry she left you too soon. Her family dumped her at a city shelter and you went and brought her immediately to the warmth and love of your home. You were there for her in her greatest hour of need. Thank you for loving this beautiful fragile lady. I am so sorry for your loss. Those two weeks she was with you were a lifetime of joy for her, I'm sure, in your care. I can imagine how attached to her you were, and I am so sorry you have to go through this. Run free sweet girl with all our friends up there. I picked up Caius last night from the humane society of Easton, PA. He looked so sad sitting in his crate. As soon as they released him from the crate he ran over to me and showered me with kisses. We had an hour drive home, and I didn't hear a single sound from him. He explored the house and seemed curious of everything around him. He went right outside and used the bathroom...no accidents so far! We leash introduced him to the other 4 dogs in the house and he did wonderful. His tail was wagging the entire time and he was was giving them all kisses. We left him in the dining room separated from everyone and he whimpered a little then settled down. He is a very active boy, definitely acts like he's 3. 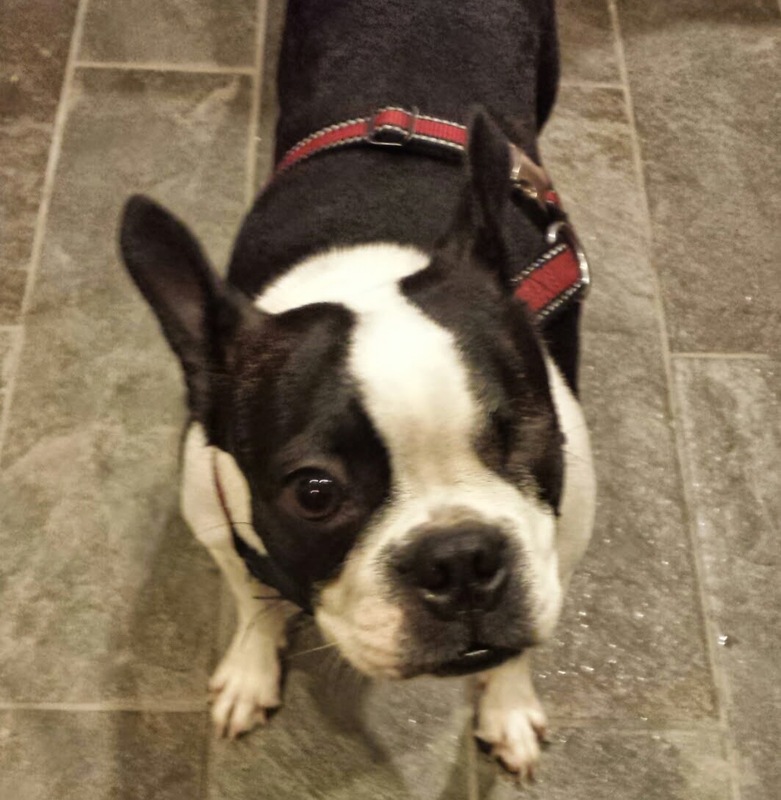 I made an appointment at our vet next week to have his cherry eye examined. Will update more as he settles in! He is so beautiful Amanda - thank you for getting him so quickly. This is a wonderful way to start the morning...all this happy news puts a smile on your face! Oh, hello dear friends. Petunia here. 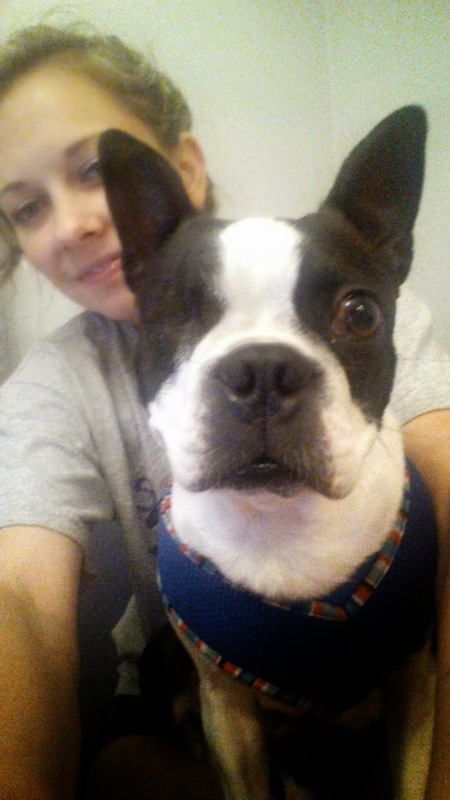 I'm one of NEBTR's newest fosters, and I am so happy to be with my foster mom Melanie. She takes such great care of me. You see, I've had a tough life. 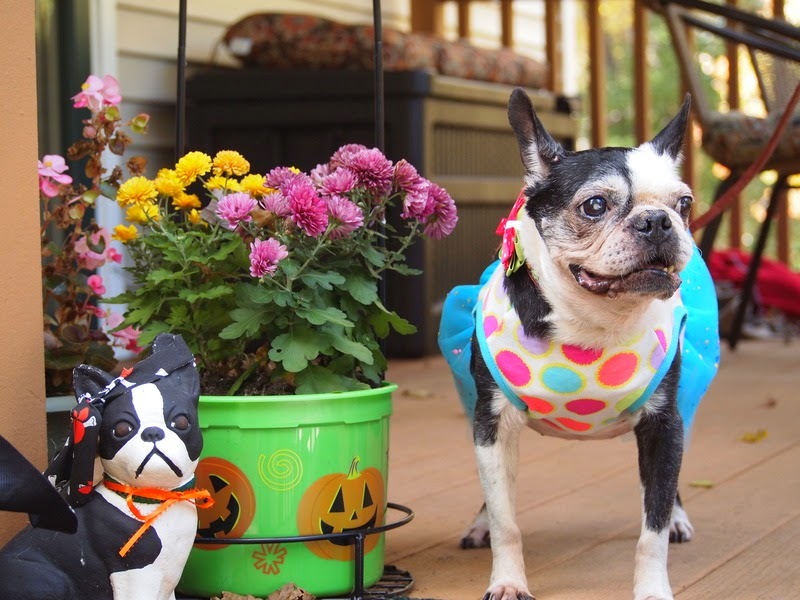 It's only been 4 years so far, but I've suffered from being in a puppy mill. My teeth are damaged, I have had frostbite, and I lost an eye. Life hasn't been easy for me, but I have HOPE. And now that I am LOVED, I think I will be able to keep going. I wanted to see if perhaps you could send me a little something. I came with nothing... not even a bed to call my own. 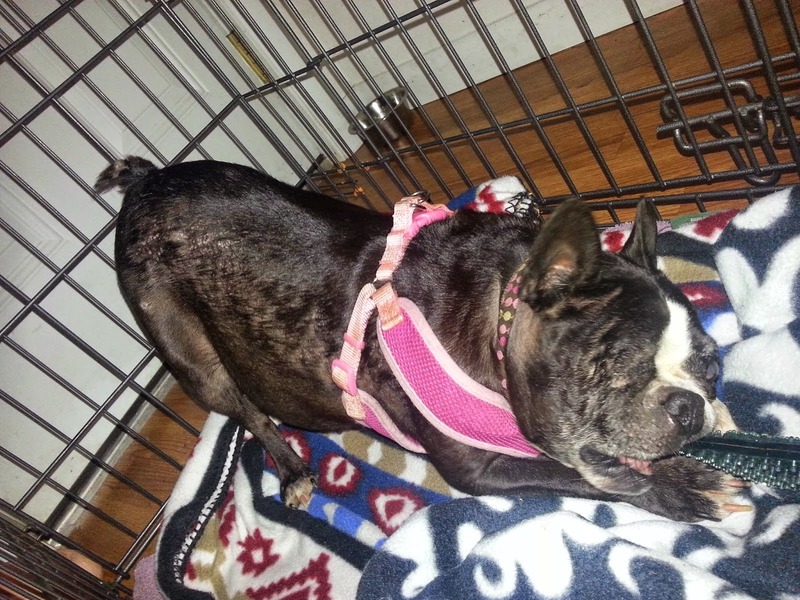 My foster mom has a lot of stuff for me, but we could use a few tiny trinkets. Could you find it in your heart to help me? Thank you friends. I look forward to finding my furever home with one of you soon! 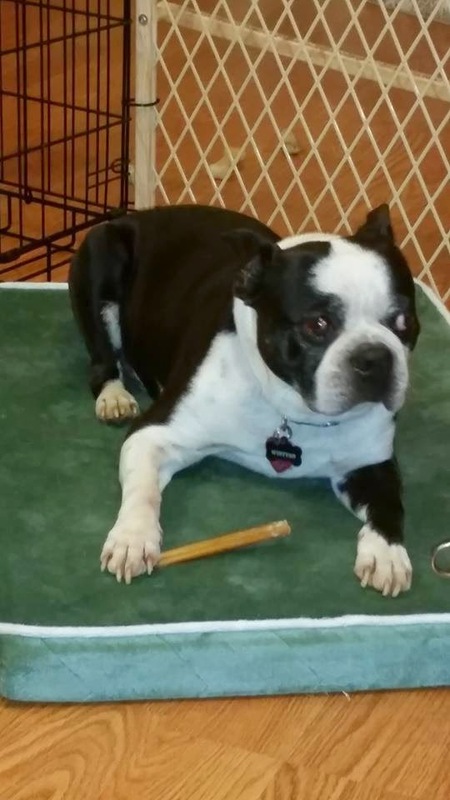 Daisy is laid back, sweet, and loves attention. She gets attached to her human(s) and loves to follow them around. You'll usually find her with a tennis ball in her mouth (even if it's not being thrown, she just likes to have it), she loves belly rubs, treats, bones and cuddling. She does well around dogs and children, and has not been around cats yet. She would do best in a home that would allow her frequent potty breaks. Prior to being rescued, Daisy was in her crate for 10-12 hours per day, but would prefer to be out and about most of the day. She does not have accidents in her crate. 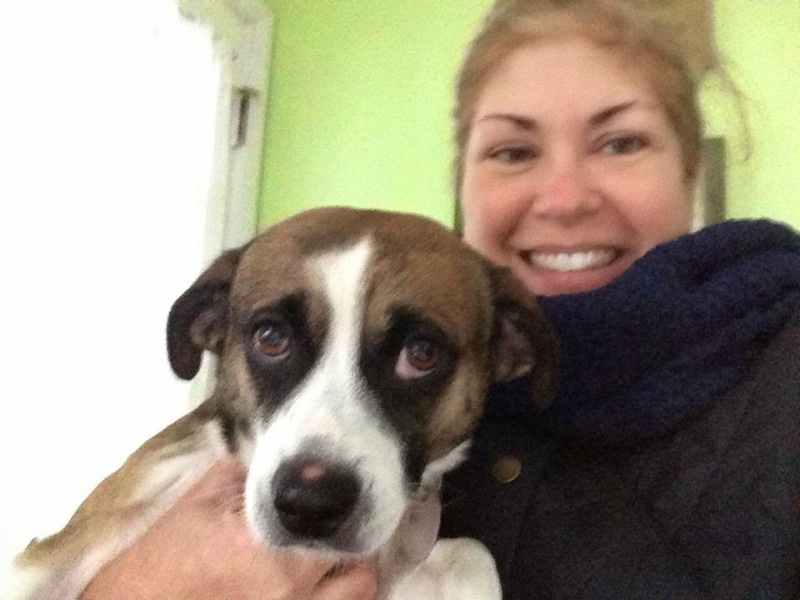 She is a little bit scared of stairs, and her foster mom carries her down them - so she would do a home without too many. 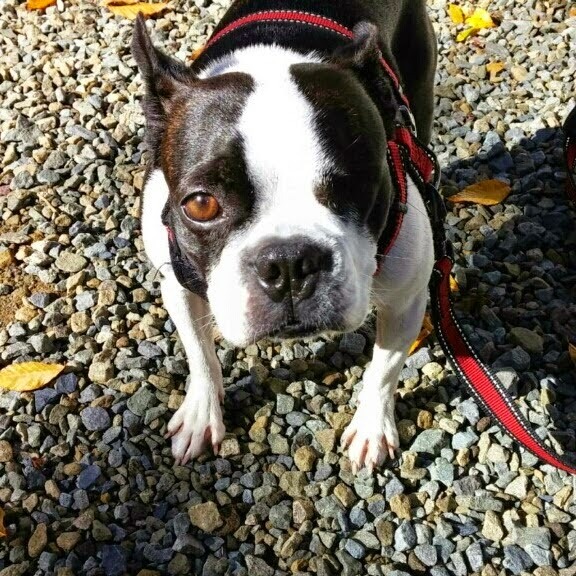 She doesn't have any medical issues except with her eye, which was removed in foster care - and has actually made her more spunky! 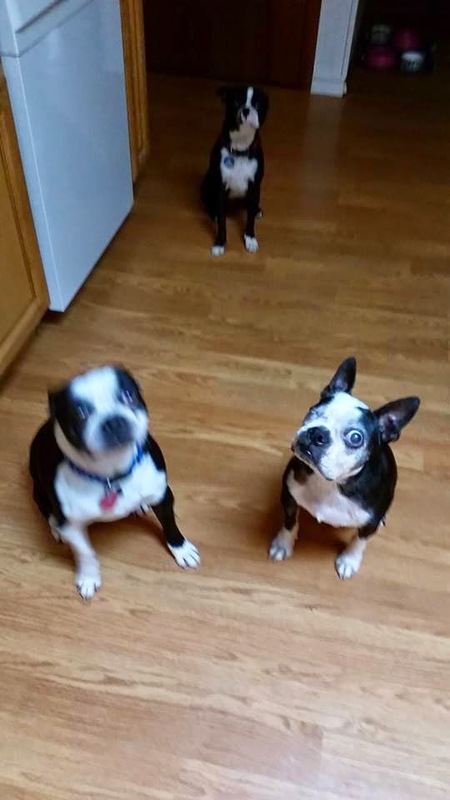 Winston is a big old attention hog and LOVES being the center of attention! He's a bit of a diva - he cries a little if you don't give him a treat after he goes potty! Another little quirk - he does a tap dance when you ask him to sit... Winston is sure to have you laughing - he has quite the personality! He is okay around dogs he is familiar with, but sometimes gets snappy around stranger dogs. 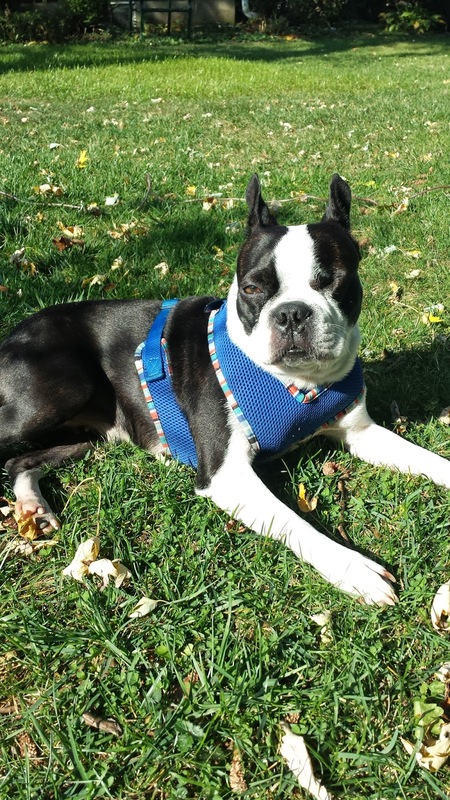 Winston needs a family that will help him with a little more obedience training, but is VERY motivated by treats! 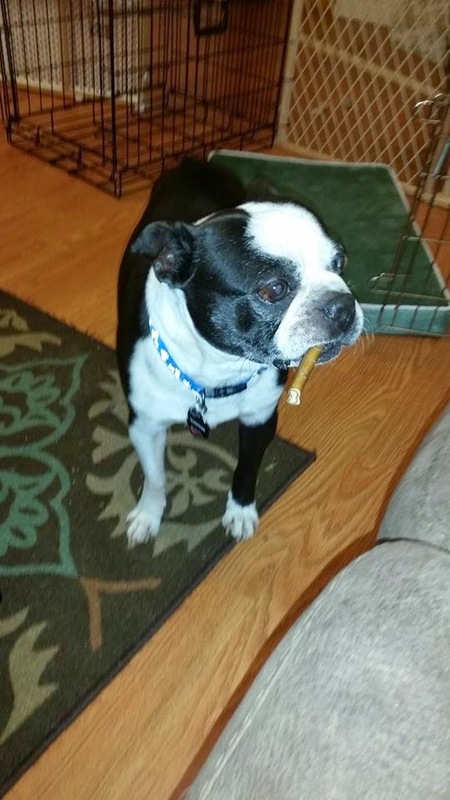 Winston would do best in a home without small children since he can get grumpy when startled. 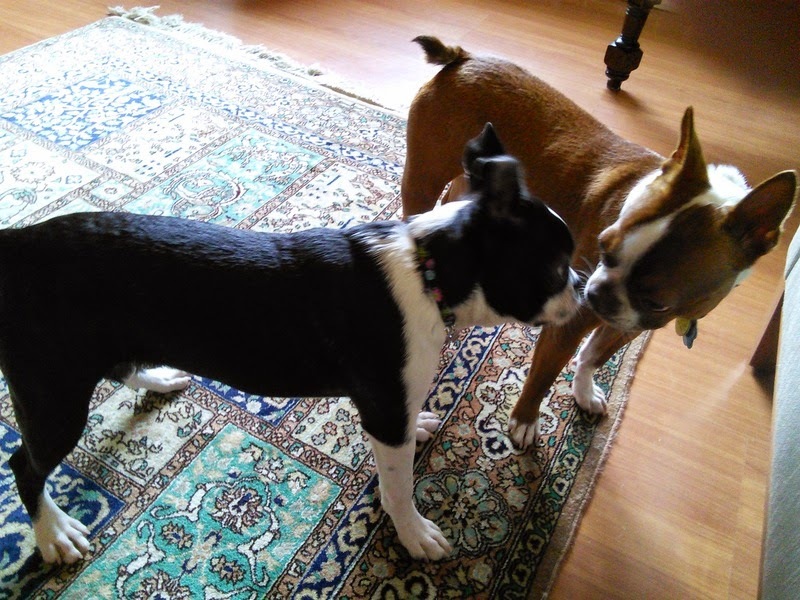 This brother and sister would be a great addition to any home looking for a dynamic and fun duo. They are sure to keep you laughing! 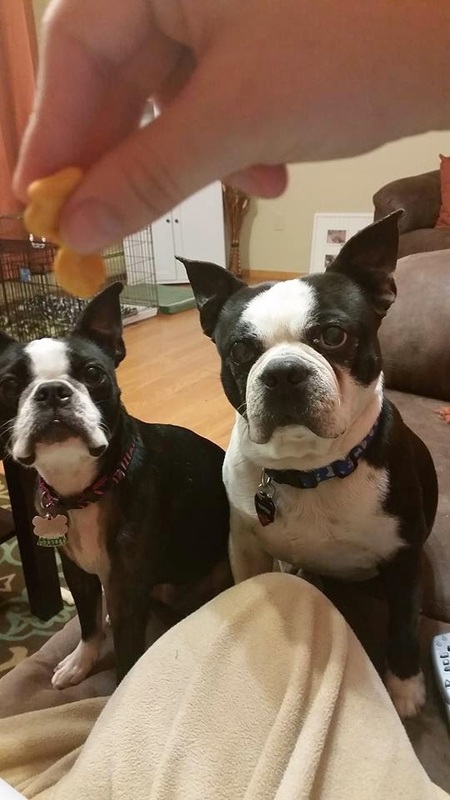 If you are interested in adopting Winston and Daisy, please fill out an application on our website: www.nebostonrescue.org. 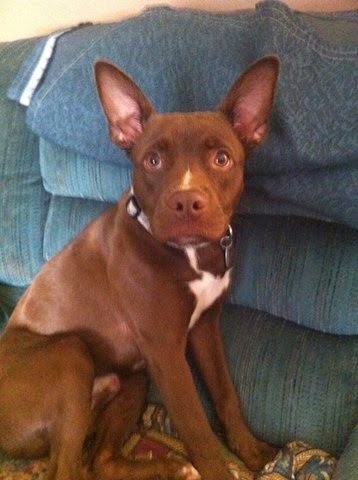 Boscoe is settling in to his new home outside of Wilkes Barre, PA. He now lives with Ray and his aide Gale. Ray is fighting MS and will be home all day, almost everyday to cuddle with Boscoe. He even agreed he could sleep under the blankets with him! Update on Glory - On the Lookout! Thanks for checking in! Nothing but thumbs up for Glory! We were just talking last night about how much he has changed already in the really short time that we have had him. He's turning into a great leash walker, with the stop and drop thing that he was doing almost completely gone. Our closest park is a 3 mile loop in the woods and he loves it! Working on more simple commands as well. His overall interaction is much different as well. He's clearly more relaxed and comfortable! Enclosed is a picture of his favorite spot. He sleeps during the day on that top cushion, and keeps an eye out of the window on who is coming and going. That's the other big change. He doesn't really worry anymore when we leave!! What an awesome photo! They look like they've belonged to one another for a very long time. Awesome match!